The Aegis Insulation Tester is the ideal tool for electricians and tradespeople. If you’re involved in the commissioning, maintenance and testing of electrical installations, you need the CZ20055. As insulation (megger) testing is an essential task for all electrical contractors and tradespeople, it makes sense to have the best tool on the market to complete the job. And with its easy to read illuminated analogue display, the CZ20055 fits the bill perfectly. 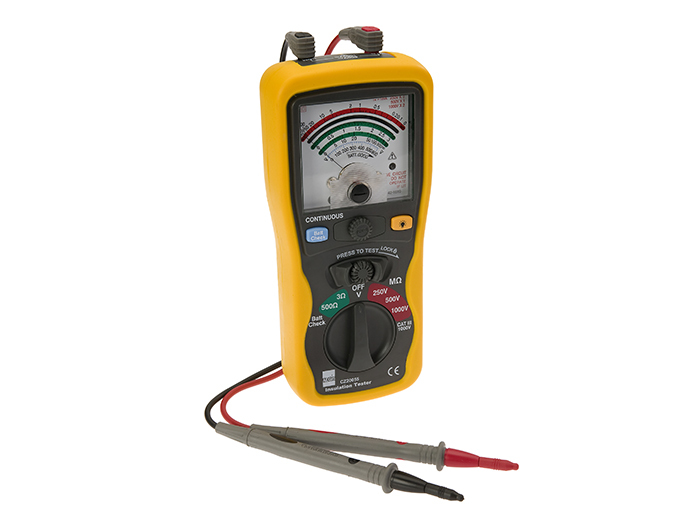 Lightweight and easy to use, the CZ20055 provides user selectable voltage outputs of 250V, 500V and 1000V for M testing, with 3 and 5000 testing also available for terminal connections. Continuity testing is also provided for basic connectivity testing. The illuminated analogue display of Aegis Insulation Tester means that you can see results at a glance. The lock button feature will hold the last reading in place until reset, allowing you the time to make a detailed recording of the results. A live circuit warning LED and hazardous voltage alarming are provided as standard to alert the user if accidental connection to a live circuit it made prior to conducting any testing. The CZ20055 comes packaged and presented in a hard carry case to protect the unit whilst it’s not in use. Purchase also includes two probe leads as well as a single lead fitted with an alligator clamp which is provided to allow better maneuverability and safety when conducting tests.